If you took a look at the Periodic Table of the Elements in Part 2 of this series and remember what I said about similar elements often being found near one another I have another important fact for you to file away. 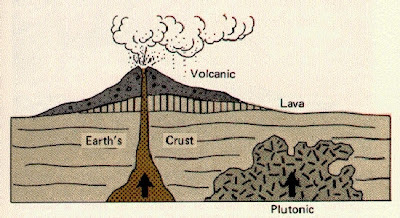 Those elements that are very stable and that are more resistant to geochemical changes tend to remain close to their source.That source, most often, is plutonic. 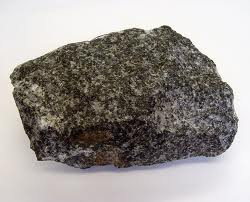 Plutonic (igneous) rocks originate in magma (molten rock) beneath the earth's crust and eventually become exposed by various means, including eruptions, fracturing, and geologic uplift (among others). Magmas invariably contain all sorts of gases and the amounts and constituents of these gases can, and do, influence mineralization. Another Form of "Fool's Gold"
These plutonics tend to form very high-temperature minerals that, in turn, form vein materials. Now before you jump the gun here gold-wise, you need to know that these sorts of vein materials are usually associated with pegmatites. Sorry, but pegmatites are not gold producers per se...however they can contain semi-precious crystals like beryl, tourmaline, and garnet and lots of mica-related rocks such as mica schist. By the way, mica is another form of "fool's gold" often misidentified as gold by novice prospectors. Minerals like mica, beryl and other semi-precious stones, feldspar, and some quartzitic rocks indicate that the elements are still concentrated in a residual liquid phase of alteration. 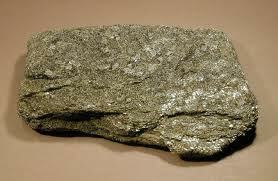 These elements tend to form in large, coarse masses and probably won't contain precious metals like gold. Instead, you're more likely to find elements similar to mica (or feldspar, etc.) such as boron, tungsten, beryllium, fluorine, tin, tantalum, and others, including a few rare earth minerals. Once magma starts to cool and is less fluid and all the high-temperature minerals described above have been deposited, there are still large volumes of super-heated liquids that recondense into dissolved metals and minerals such as sulfur and silicon. Eventually this solution "escapes" into regions of lower temperature and pressure and the dissolved elements combine and form along cavities or fissures into veins or lodes. It's these lower-temperature deposits that we, as gold prospectors and miners, should be on the prowl for. Why? Simply because they are the type of geochemical/geophysical environments most likely to contain deposits of precious metals like gold, silver, and platinum. There's more to come. In the meantime, best of luck out there. If you liked this post, you may want to read: "'Salting the Works? :' Decide for Yourself"